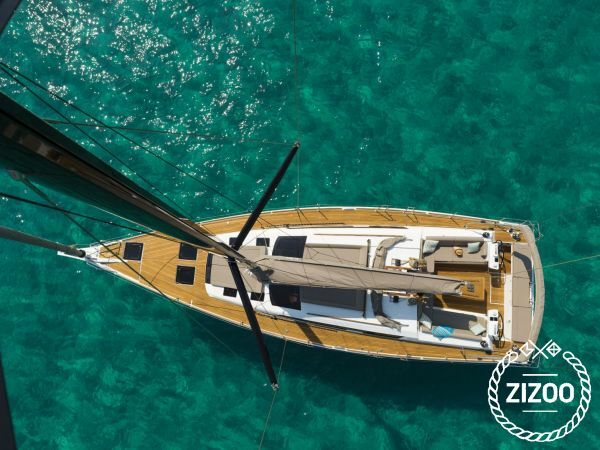 This Dufour 520 Grand Large sailboat, built in 2018 and equipped with water maker, air conditioning, cockpit fridge, rear deck barbeque, generator/inverter and a large bimini. An excellent choice for those wishing to experience the Greek islands in style and comfort. Wake up to the sound of the sea in one of the Dufour 520 Grand Large’s 5 spacious and modern cabins. Sleeping up to 10 people, this sailboat is perfect for sailing with friends and family. The Dufour 520 Grand Large is located in Alimos Marina, Athens, a convenient start point for exploring Greece by boat. Happy sailing.